A handful of varieties are in cold storage just off the little pick-your-own retail space in the front. 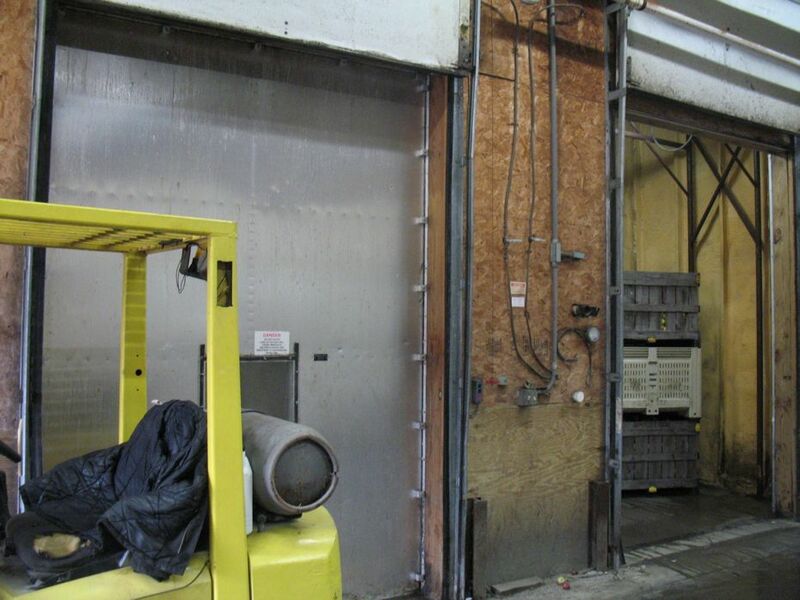 One of the large cold storage rooms. 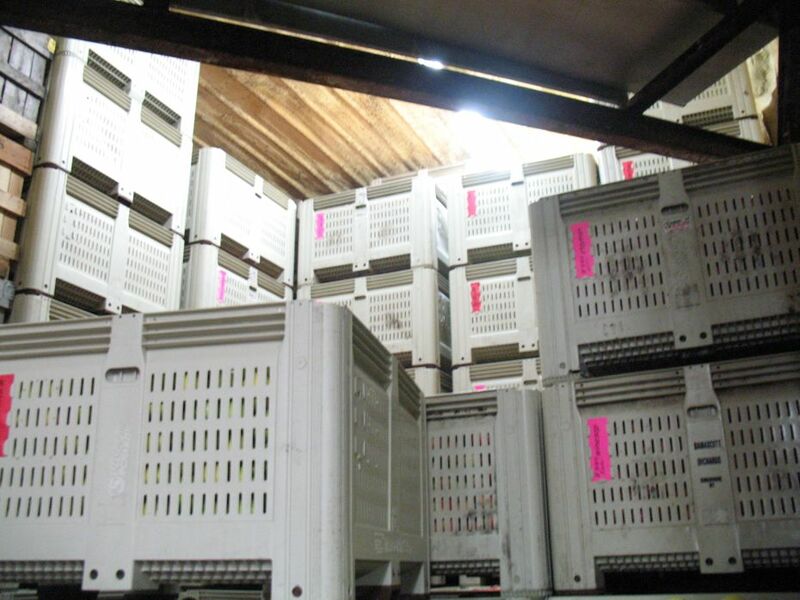 Each one of those totes holds 20 bushels of apples -- so, approximately 2,000 apples in each tote. Jake Samascott says the orchard produces about 50,000 bushels of apples each year, though than can vary greatly depending on conditions. The storage rooms can be sealed off, and the each have what's essentially a giant garage door. 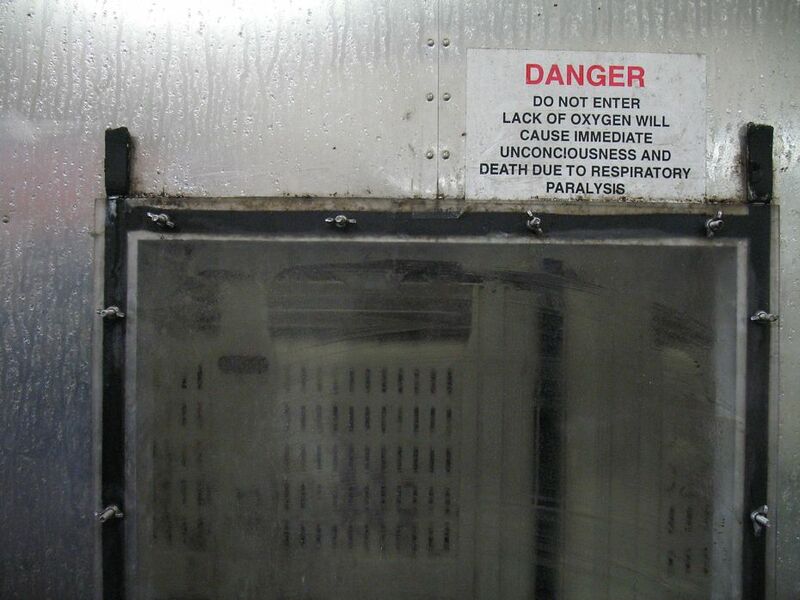 These are low-oxygen storage spaces. The apples are stored at 32 degrees, and nitrogen is pumped into the space so that the air inside is just 2 percent oxygen. (The earth's atmosphere is 21 percent oxygen.) 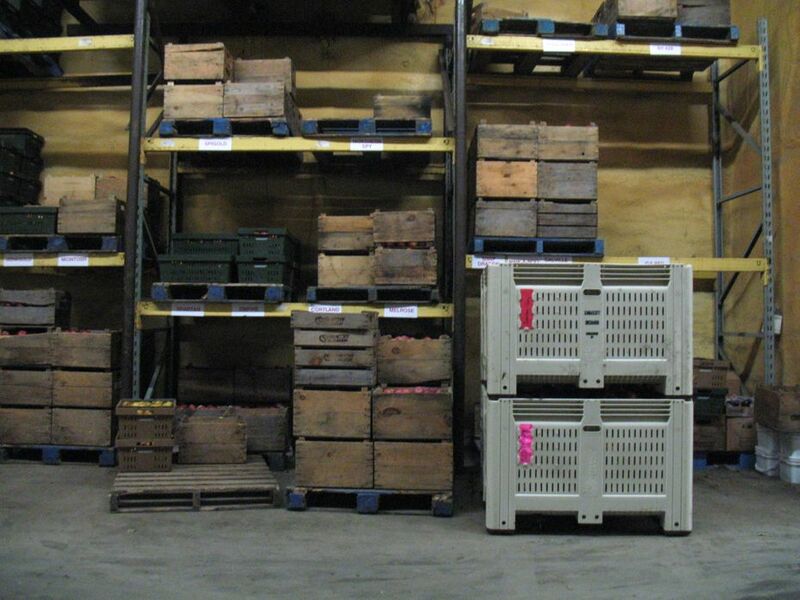 Some varieties of apples can be held in these spaces until next summer. 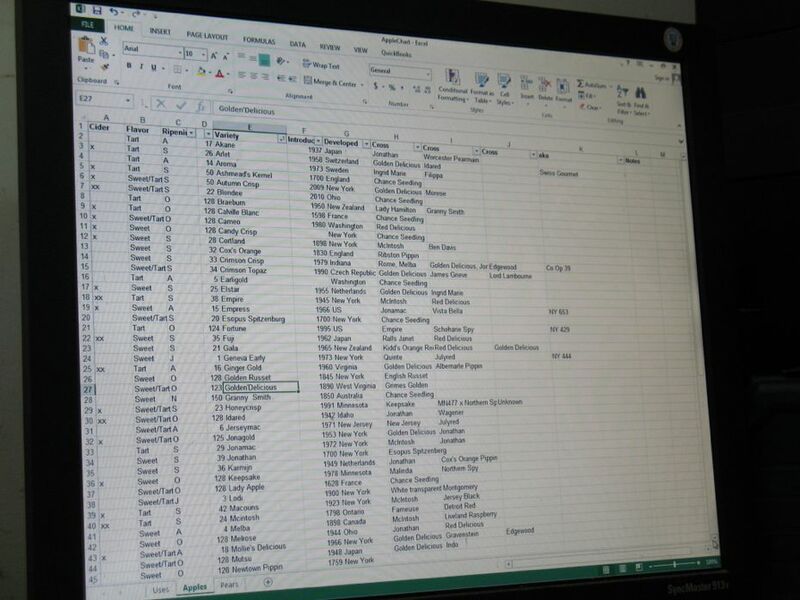 Jake Samascott keeps a spreadsheet of all the different types of apples they grow. For grading an apple by size. You never know what you might find inside. One of the fun things about the Capital Region in the fall is that we're surrounded by apple orchards. And there are all sorts of good things that go along with that: weekend apple picking trips, cider donuts, all that stuff. But it also means we have access to a wide range of different apples -- way beyond the same 10 or so varieties you see in the supermarket all the time. And given that there are literally thousands of apple varieties, why limit yourself to the same-old Macs, Galas, and (shudder) Red Delicious? 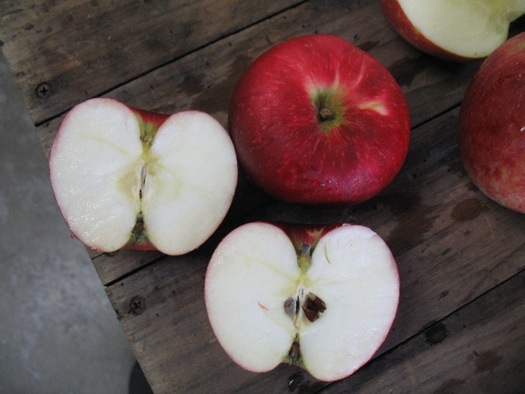 We took a drive out to Samascott Orchards in Kinderhook recently to try some unusual apples. Why are unusual apples unusual? 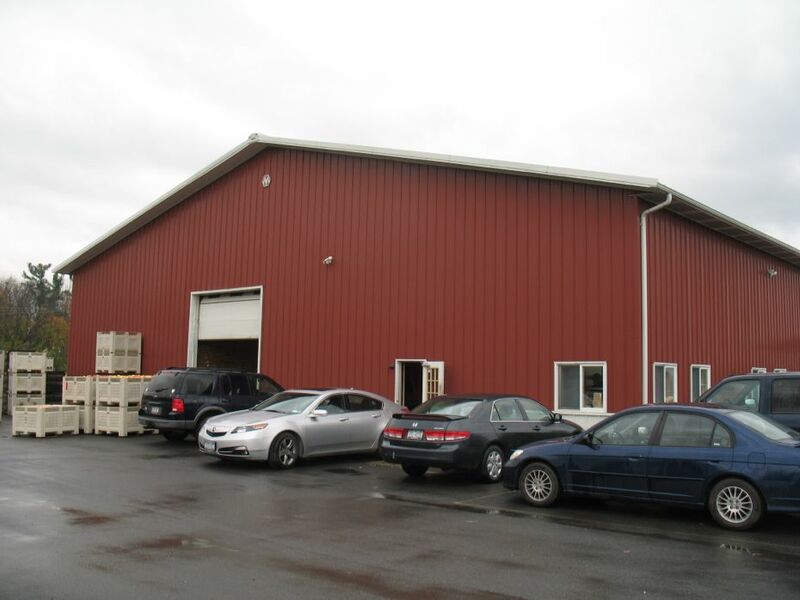 The Samascott orchard started in the 1960s when Oliver Samascott acquired the land -- and a handful of apple trees -- while expanding the family's dairy farm. As Jake Samascott -- Oliver's grandson -- said to us: "He kind of fell into apples." As the Samascotts phased out the dairy farm, they expanded the apple orchards (along with many other different crops). They now grow 75-80 varieties of apple. 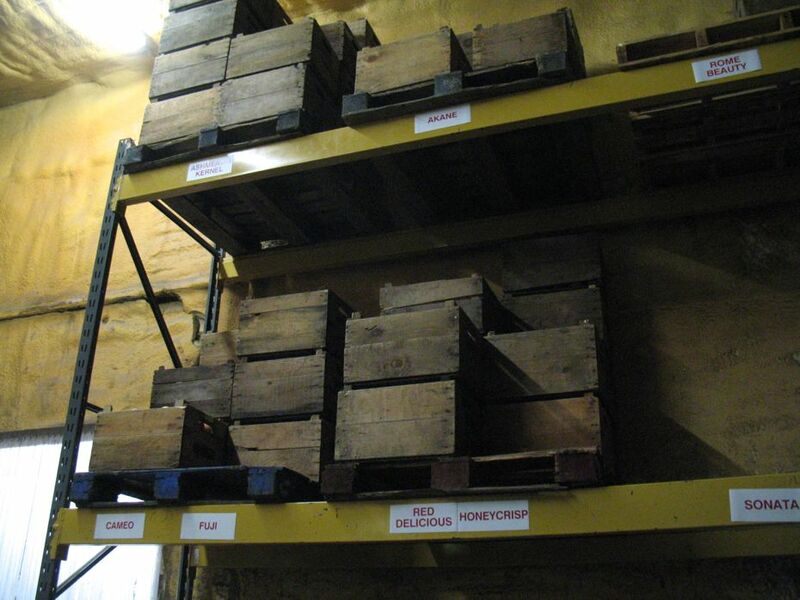 "Some of the old varieties have real good flavor," Jake Samascott said to us as we sat in an office in the corner of the orchard warehouse, just off from where apples were being pressed for cider. 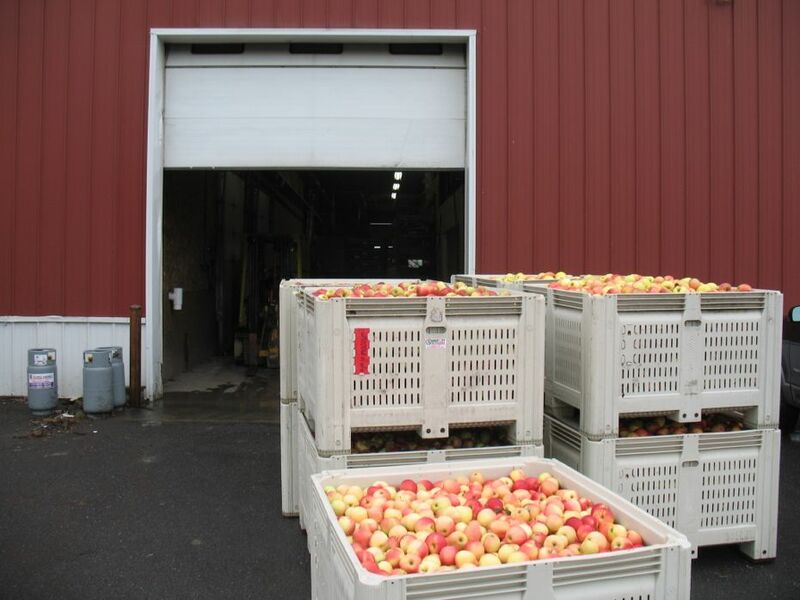 "Some of them are geared more toward the hard cider makers -- the Golden Russets, Newtown Pippins, Ashmead's Kernel -- those hard cider guys are looking for those varieties. But they actually do have great flavor, and they are good eating apples, in my opinion. Good texture, good sweet-acidic flavor." OK, then why the same small group of apple varieties in most grocery stores? Well, modern supermarkets are built atop huge, complicated supply chains. And these systems allow what is, historically speaking, an amazing level of abundance. The tradeoff is that they also require a high level of standardization. And a lot of apple varieties just don't fit the template. "If you're selling to grocery stores or Walmart or any of these big, huge stores, you gotta have consistent size apples with the same look," Jake Samascott explained. 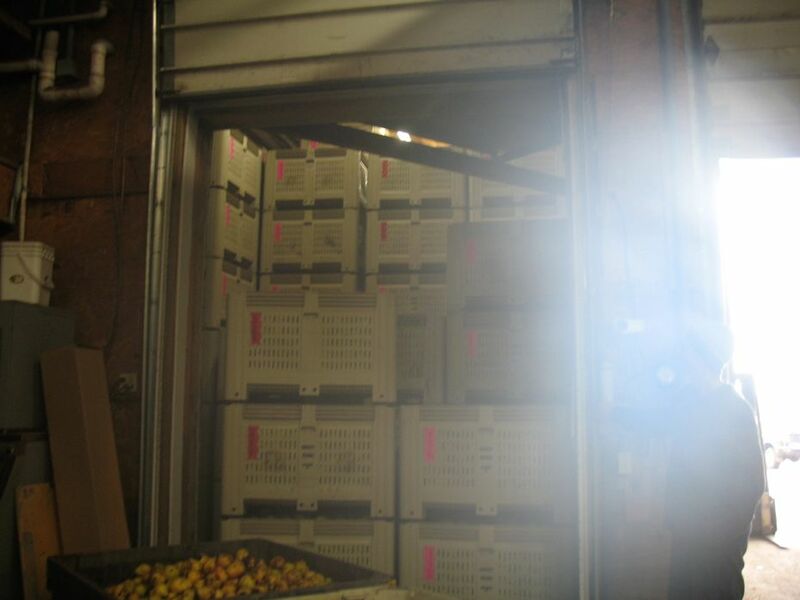 "Once these apples go through a packing line, they get graded by size -- they want everything 80 count [per bushel] or 100 count, depending on the variety. They need to be attractive because in a grocery store there's no one there talking about them, telling them about how good the apple is." 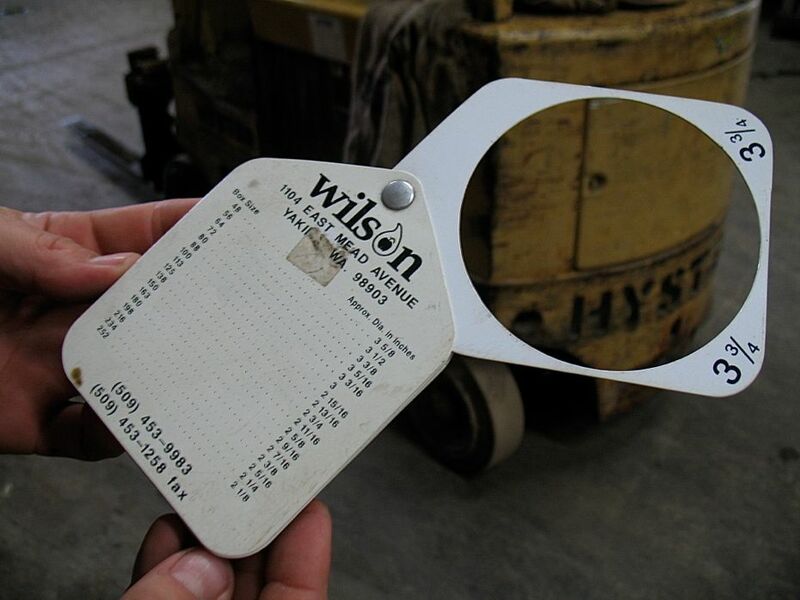 For grading apples by size. That drive for a standard apple that looks great and keeps well in a display case -- that can essentially sell itself -- is part of what contributed to the Red Delicious becoming one of the most popular supermarket apples. The other thing about those modern strains of beautiful, standard Red Delicious apples: They don't taste good. Jake Samascott says that flavor-for-looks swap is true of many modern varieties: "They were grown for looks, they were big and beautiful. Put on a shelf, and people were attracted to it and so they bought it. 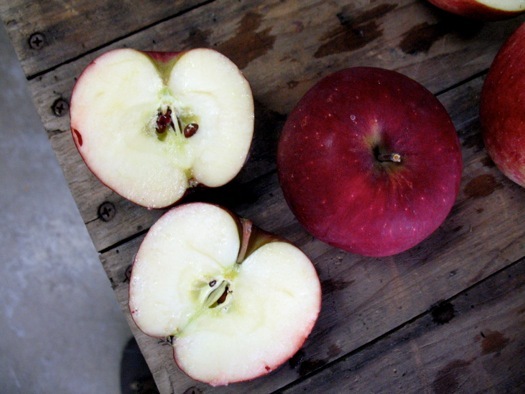 And they've kind of gotten away from flavor, complexity in the apples." Luckily, every apple seed is a new type of apple. That's not to say they're a good eating apple -- some of the trees grown from seeds don't even produce fruit -- but historically that didn't matter too much because a lot of trees were planted for hard cider. (Johnny Appleseed wasn't planting those trees for healthy snacks.) 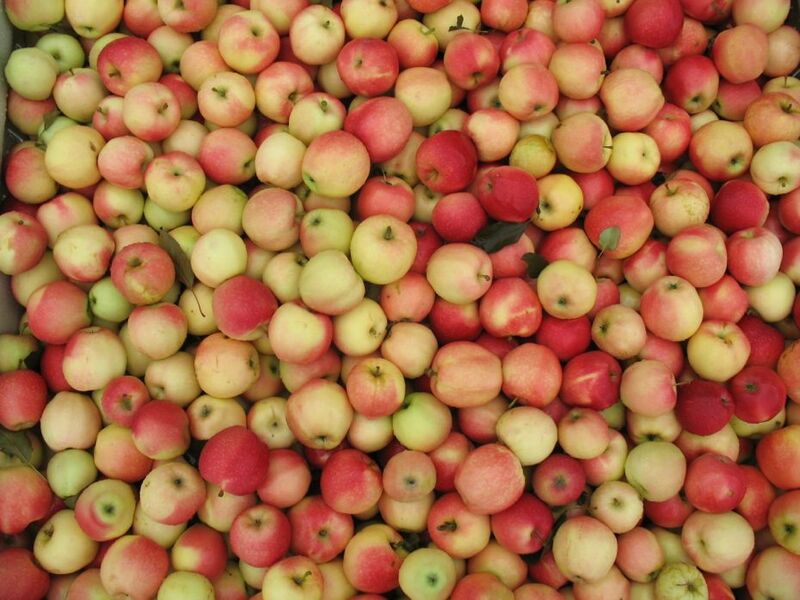 And as a result, there are now thousands of varieties of apples (some of which have already been lost to history). And many are still grown today -- albeit in smaller numbers -- at orchards such as Samascott. What are these apples like? Many are more acidic than the mainstream apples. They tend to look a little weird -- with lopsided shapes, or russeted skin. And many have some quality that just makes them unsuitable for the mass market supermarket system -- they don't grow in consistent sizes or they don't keep for long periods of time. These aren't flaws, necessarily -- they're just... non-standard. And that can be good. 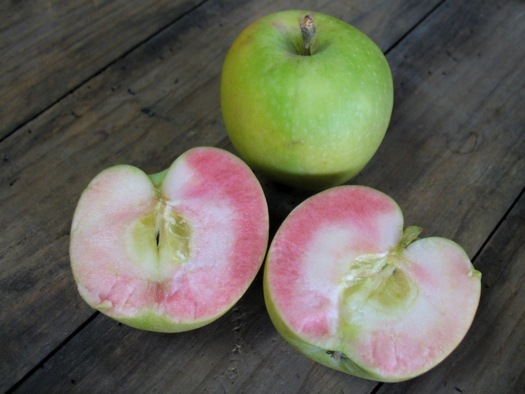 "I think more of the older, more heirloom varieties have more of a complex flavor, they're just more interesting to eat," said Jake Samascott as we talked about favorite apples. "Like, you take a McIntosh, it has a good flavor. It's just... everyone's had a McIntosh. It gets kind of boring after a while. It doesn't stay crisp for very long. But you try a Calville Blanc or Ashmead's Kernel, they're very complex, deep flavors." 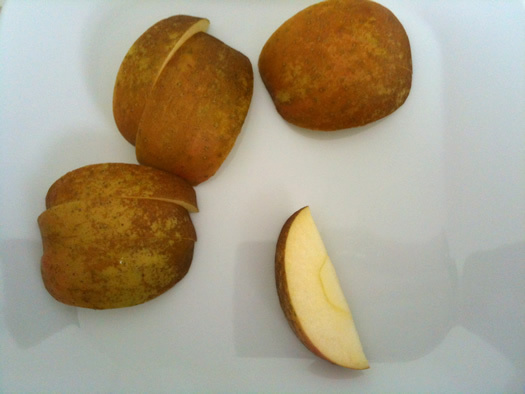 Snacking on an Ashmead's Kernel apple. Samascott says the orchard's retail customers -- many driven by an interest in local food -- are embracing these uncommon apples. "If we bring new varieties to the farmers' markets, people are very excited to try anything new we have. Because they've been shopping with us, and they know we have good products, and they're willing to try new apples even if it doesn't look perfect. Once you get someone to try it, most of [the apples] have pretty good flavor. And it gets people excited. They come looking for new varieties each week, and it keeps them anticipating new things to come." Farm stand and cider maker demand has been so strong for Golden Russet, that Samascott says they've planted new trees of that variety. So what are his favorite apples? 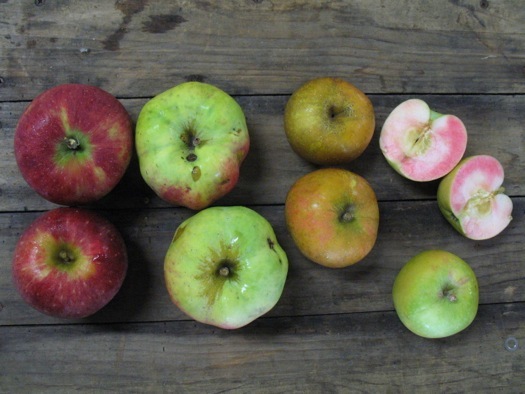 Mutsu ("I named my dog 'Mutsu'"), Cameo (crisp, sweet, stores well), Karmijin (a Cox's Orange Pippin/Jonathan cross from the Netherlands), Golden Russet, and for late season -- Pink Lady. As he said with a laugh: "When you eat apples all day it's nice to have some variety in texture and flavor." Jake Samascott pulled a handful of unusual varieties out of the orchard's storage for us to have a look and taste. 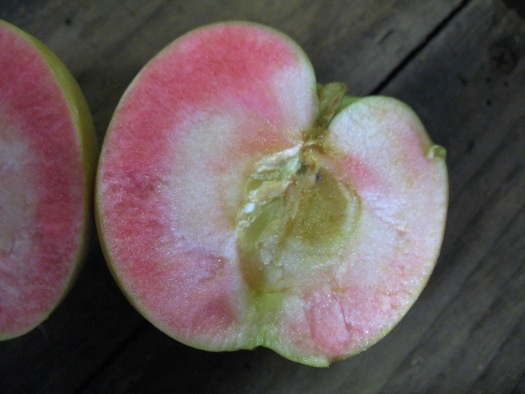 This apple -- a chance discovery in Oregon -- goes by a few names, including "Airlie Red Flesh" and the trademarked "Hidden Rose." Samascott calls them "Peek-a-boo." It's tart, more of a baking apple. But the inside is a fun surprise. 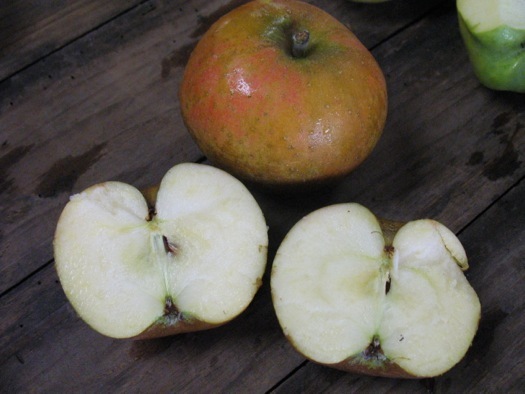 Ashmead's Kernel is an old English variety. It's russeted and small. Its texture is crunchy. And its flavor is sweet/tart with hard-to-describe accents. The Calville Blanc, in Jake Samascott's words: "It's not a very attractive apple, it's kind of yellow-ish green and it almost has a ribbed texture. It's funny looking ... But it has a great flavor and it's very high in vitamin C. It has some weird characteristics. But I think it's good eating." It's a very good baking apple. 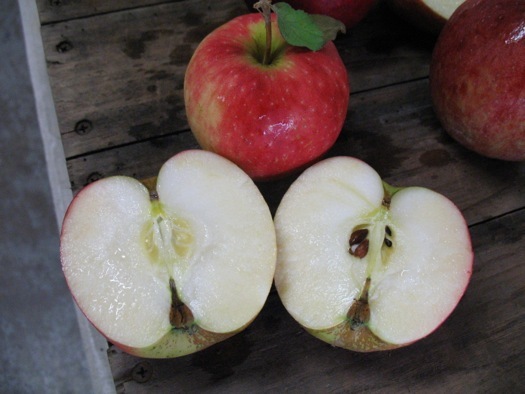 As unusual apples go, the Winesap might be relatively well known because it was once somewhat popular. It's an heirloom variety originally from Virginia. It's tart. 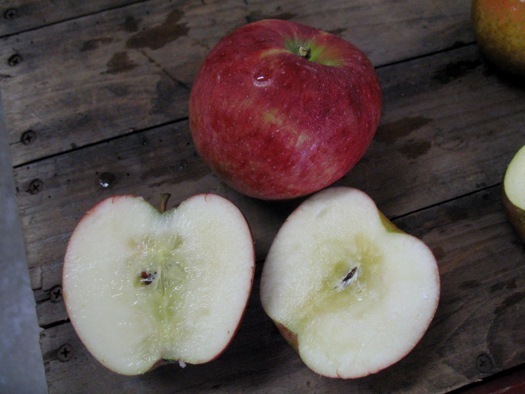 The Stayman Winesap was developed in Kansas (by a guy named Stayman) from the Winesap in the 1860s. It's sweeter than a Winesap. 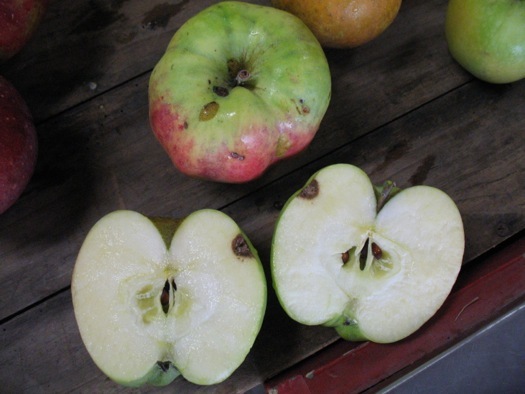 The Arlet was developed in Switzerland as a cross from Golden Delicious and Idared. It has a nice, mellow sweetness. 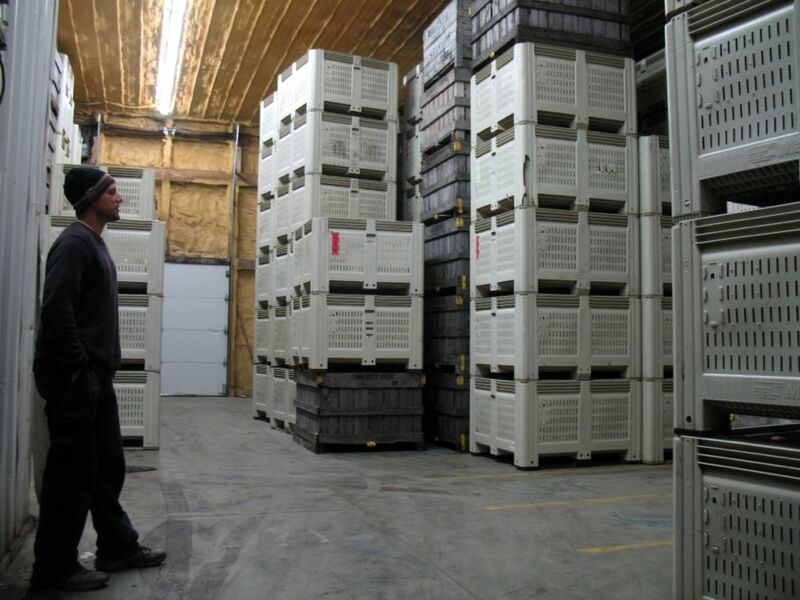 While we were at Samascott we got a short tour of its apple storage warehouse. Photos are above in large format -- click or scroll all the way up. Feel very lucky to get Samascott's apples in our NYC farmers market. They are the best! I recently tried the Ashmead's Kernal apples for the first time after a recommendation from a person working at Honest Weight. They're fantastic! Don't be put off by the skin. It's not shiny but it's tasty. "Luckily, every apple seed is a new type of apple." This is one of the most amazing and fascinating things about apples. Plant the five seeds from any apple and you get five different trees. The varieties here are just the tip of the 'berg but man do they showcase the diversity. And we lost the vast majority of those during prohibition. Seems like apples are just starting to come back into their own. There's some really interesting info about the history and biology of apples in Pollan's Botany of Desire, IIRC.